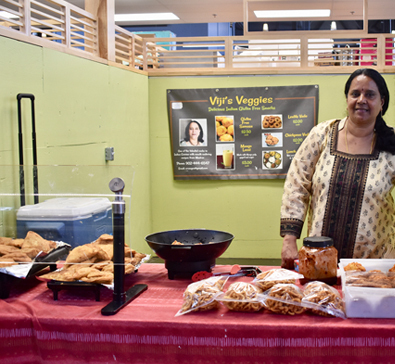 Viji's Veggies | Halifax Seaport Farmers' Market Ltd.
Viji’s Veggies. Indian Food Samosa and Chutney, Masala Dosai, The authentic drink called mango lassi made with mango, yoghurt, a little milk and sugar. Specialized in Gluten free snacks and vegetarian only and the best krispy and spicy samosas can take order for small meals for 20 people for any occassion, home delivery can be made 1 meal at 8 dollars 4 items can be given. Now a day’s am giving lot of Gluten free snacks 1, Chick peas vada 2, Lentils vada 3.Chick peas twist 5 pcs in a bag. This is a real spicy snack which is gluten free vegan too. People said that they are using this sa topping in their salad and soups to give a crunchy taste.come and enjoy a gluten free thali and Indian meal. I am also giving lentil samosa and veggie spicy rolls.